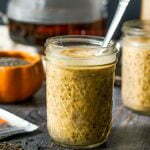 This pumpkin chai chia breakfast pudding has all that you need for a healthy breakfast. It's low carb, high fiber and has a little caffeine kick from the chai tea! And it's only 3.7g net carbs per serving! Add chia seeds to chai tea. Mix well and refrigerate for a few hours or over night. In a large bowl, add chia seeds, pumpkin, protein powder, almond milk and cream. Mix well with a whisk and then taste to see if you want more sweetness. I liked mine as is. Divide into 4 jars and store in the refrigerator. You can also add a bit of whipped cream to make it into more of a dessert.